Vornado proposed dividing building’s recently landmarked interior into two retail spaces. On March 15, 2011, Landmarks considered Vornado Realty Trust’s proposal to renovate the interior of the Manufacturers Trust Company Building at 510 Fifth Avenue and 43rd Street. 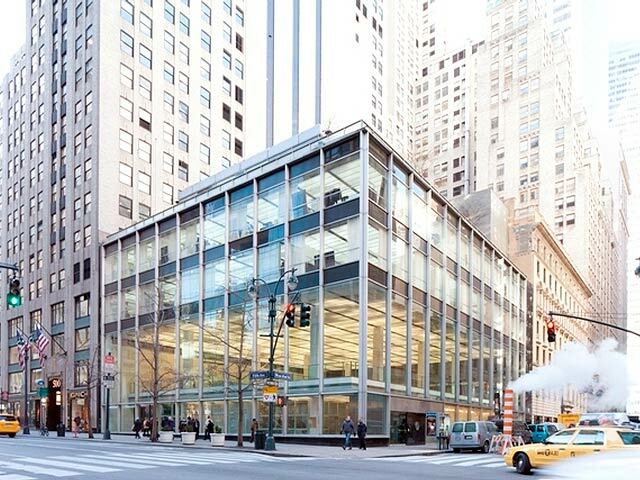 The 1954 modernist, glass-walled building designed by Skidmore Owings & Merrill is an individual City landmark. Landmarks recently designated the first two floors of the building as an interior landmark in February 2011. At Landmarks’ hearing on the designation, a representative of Vornado testified in support, but explained that “sensitive interventions” would be required to convert the building to an economically viable retail use. 8 CityLand 28 (March 15, 2011). Attorney Meredith Kane testified that Vornado planned to renovate the building in order to accommodate two retail tenants. The Canadian retailer Joe Fresh would occupy a portion of the building’s ground floor and the cantilevered second floor. Vornado had not yet identified a second retail tenant. Vornado hired Skidmore Owings & Merrill to design the overall renovation plans, and Joe Fresh hired Callison LLC to renovate its retail space.At the March hearing, Skidmore’s Frank Mahan testified that the proposed alteration work would strengthen the building’s primary characteristics. Ground floor partition walls obstructing the building’s glass facade would be partially removed. The former bank’s iconic vault door would be cleaned and restored. One of the vault’s walls, however, would be demolished to open up floor space. Currently mismatched ceiling panels would be unified and arranged in their original pattern. Two free-standing escalators would be removed and replaced with new escalators in a less central location. The new escalators would no longer be parallel but instead criss-cross each other. Vornado would also build two new glass entrances along Fifth Avenue. The building’s first floor would be divided into north and south retail spaces using opaque glass with a transparent transom to preserve the visual effect from the expansive luminous ceiling. Two thirds of the first floor’s glass ceiling would be removed to restore the experience of the cantilevered second story. Preservationist groups commended Vornado for attempting to adaptively reuse the building, but objected to some of the major alterations. The New York Landmarks Conservancy’s Andrea Goldwyn objected to the escalator reconfiguration and vault demolition. Manhattan Community Board 5 submitted a letter recommending approval, with the exception of some proposed signage. Chair Robert B. Tierney stated that adaptive reuse was often the best way to preserve a historic structure, but noted that the proposal presented challenges due to the building’s importance. Commissioner Fred Bland agreed that alterations were necessary for the building’s continued use, but argued that a “better retail environment does not legitimate” reconfiguring the escalators. Commissioner Margery Perlmutter argued that it would be premature to alter the vault before Vornado identified a second tenant. Tierney asked Vornado to continue to work with Landmarks’ staff to refine the proposal. LPC: Manufacturers Trust Company Building, 510 Fifth Ave., Manhattan (11-5333) (March 15, 2011) (Architect: Skidmore Owings & Merrill; Callison Architecture).